What do Tom Brady and I have in common? While I am a moderate sports fan, I was recently shown an article about Tom Brady, an NFL American football quarterback for the New England Patriots who because of his accomplishments (one of two players to win five Super Bowls) and accolades (honored with four Super Bowl MVP Awards), is considered by many analysts and sportswriters to be among the greatest quarterbacks of all time. The gist of the article is that no matter what you should not let situations define you. I like the way that sounds… being ‘undefinable’ is a far more thought provoking concept than being rebellious. It was something worth reflecting upon. There is so much about my illness that has tried to define me. I’ve resisted being lumped into the awareness campaigns, designated colors, months set aside for mindfulness – trust me, no one is more aware than I am. I get it loud and clear. And while I do not begrudge any of those efforts, I just don’t need them to define me. At the onset of my diagnosis, I thought that the only way to get through each day, and guide those around me, was to define and interpret things for myself. Taking charge of those few petty details that I could control was the only sense of ownership I could muster up. Perhaps that was the lens I needed for that time frame; I don’t discount those thoughts and feelings, however without knowing it, the latest curve that life threw me gave me a warranted sense of ownership. I wasn’t going to take another surgery passively. I was going to do it the Frank Sinatra way- My Way. Fine. I’ll be reasonable, I’ll agree that the doctors know best and have my best interest at heart, but I know my body. In fact, being the boss of my body and being in tune to how different things affect it is something I’ve grown to believe is invaluable. I set the terms of how and when this surgery was going to happen and stood up for what I wanted. My team of doctors backed my decisions, having worked closely with me over the last 17 months. This time it was going to be different. My terms? I needed to keep my promise to my kids that I would take them skiing this February (and with the physical and mental support of my family, I did just that), not going under during surgery and no hard drugs post-procedure to fight the pain rounded out my ask list. Crazy? Totally, but it worked. Yes, I can’t pretend I didn’t have a few rough days, I did. The trick was to get past it and arrive at the next day ready to tackle the situation at hand. I used work as my crutch to keep my mind busy when I wasn’t trying to sleep it off. Up until a few years ago I had only had one surgery when I was 5 years old and my tonsils were removed. In the last few years I’ve now had six surgeries (that’s alotta of F*&ing surgeries). I share this with you because we all have our challenges, curve balls, you name it, and there is no reason why we need to be defined by these situations. Take a moment, reflect, set your terms, trust that you know what’s best for you – there are many ways to get to one end result. And I’ve got to tell you that it was probably the most enjoyable surgery imaginable and of course the only one I can remember – yes I even swapped food stories and photos with my anesthesiologist. This ‘undefinable’ concept can be applied to so many situations in life; the parallel can even been made to food preparation. For example, if you think about it, there are thousands of pasta recipes, and therefore many ways to get to the same delicious end result based on available ingredients, dietary needs, etc. Taking artistic license with your creations is fun. 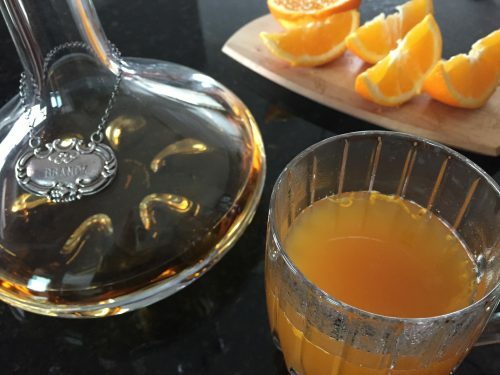 This week, with so many around me coming down with the flu, I headed back to the ‘bar’ to take another pass at a ‘medicinal’ turmeric beverage. 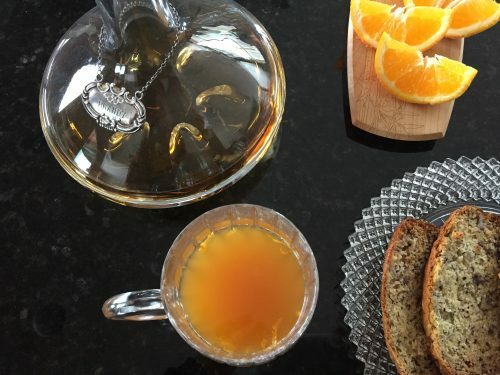 The Turmeric Citrus Hot Toddy. The healing properties of turmeric are well documented. 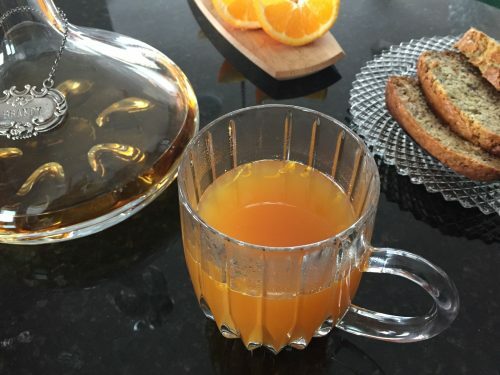 Combining turmeric with the medicinal properties of ginger, honey and brandy and you’ll be feeling better by the time you gaze into the bottom of the cup. Combine turmeric tea bags, ginger, orange juice and water in a pot, mix well and heat until boiling. Turn off burner and add in honey and brandy. Stir well to combine. Heat for 2 minutes longer and serve piping hot.